Drafts 5 has totally won me over and made me fall in love with url-schemes. They are basically a local restful API that can be used to accomplish quite a bit. 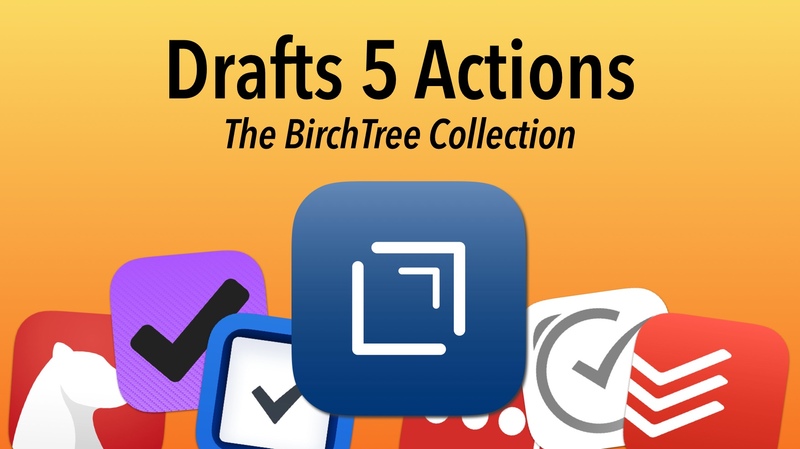 Below are 6 Drafts Actions that I have created to make using Drafts even better. All of these apps have actions already, some of which are even built into Drafts by default, but my versions are better in every case. While the actions you could previously get only let you add one element to a note or task, these actions will let you add tags, due dates, project names, and more. I don’t ask often, but if you enjoy these actions and want to support my work, you can support BirchTree directly with a donation. All proceeds are pumped back into the website and allow me to keep dedicating time and effort into this passion project. Don’t feel compelled to donate if you don’t want to, but every dollar is dearly appreciated. Add a note to Bear with a title (required), tags, pin to the top, and of course all the content you would like. First line of your draft will be the Bear note title. Write “pin” on a subsequent line to pin it to the top. This is the content of my post, it is gooooooood. It can be on multiple lines as well! Note: I am working on a similar action for Ulysses, but Ulysses’ url-scheme is really elaborate and I want to do something really special with it, so that will be slightly down the road. Todoist doesn’t have the most robust url-scheme for creating tasks, but this will allow you to create tasks with due dates and priority flags. That will make a task for “Take a walk” at 3PM tomorrow and set the priority to 4. Create simple reminder in Due. The reminder name must always be on the first line. The only other value that can be passed is a due date based on how far in the future you’d like to be reminded. Acceptable times must be prefixed with “in “ or “In “ and can be in seconds, minutes, or hours1. Simply searches LastPass for the text in the draft. Note that 1Password is my password manager of choice, but this action gets the job done already. This is the same as the built in micro.blog script, but you can add a post title by adding a line with “# ” (include the space) in the first line of the draft. The first line will be the title (minus the pound sign and space) and everything below that will be the content. If there is no “# “ on the first line, the entire draft is assumed to be the content and no title will be added. And this is the content.